Hikers Hostel is located in Plovdiv the cultural capital of Bulgaria. The city lies among seven hills and is therefore called The town of the Hills. Its 8000-year-old history has contributed to its present authenticity and beauty. Many cultures have left a trace behind and the mixture of Roman, Trace, Ottoman and traditional Bulgarian architectures add up to the romantic spirit of the town. 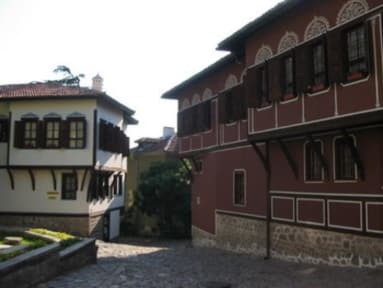 Hikers Hostel is located in the beautiful Ancient Town of Plovdiv, which is adjacent to the city centre, on Nebet Tepe (Nebet Hill). The two-storey building represents the typical architecture from the Revival Period of the 19th century in Bulgaria. Although situated on the main cobblestone-paved street in the Ancient Town, the area is peaceful and is the perfect home for the numerous arts and crafts houses. The hostel is surrounded by many museums, arts galleries, arts schools, churches and museum-houses from the Revival Period that once belonged to renowned Bulgarian artists. About 200 metres away from Hikers Hostel is the famous Ancient Amphitheatre, built by the Romans. It is by far the best preserved artifact and along with the incredible acoustics, which needs no additional sound system, the Ancient Amphitheatre is the perfect spot for symphonic orchestras, concerts and theatre plays. Hikers Hostel organizes daytrips to different locations in Bulgaria. The predominant destinations are in the Rhodopi mountains, Stara Planina, caves, historical monuments, monasteries, museums and hiking eco-paths. For more information and pictures check out our website in any search engine. 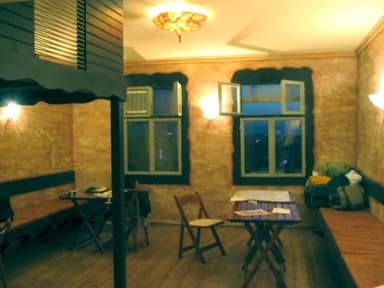 Hikers Hostel is a place that offers the opportunity to anyone to fully appreciate Plovdiv by the merits of its unique atmosphere. The pleasure of staying at Hikers Hostel will make you want to stay longer than planned. Bon accueil et bonne ambiance ! Je recommande ! L'auberge est en travaux, mais le site hostel world ne prend pas en compte la fermeture de l'établissement. Nous avons été appelé par le gérant qui nous a réservé une place dans un autre auberge très bien. Funky monkey hostel. Amazing staff and ambiance, is very close from everything and the price is correct. Amazing, the best hostel we stayed in so far, nice people, great atmosphere, the location is perfect and the owner really kind. Too bad we only stayed 2 nights ! Staff is nice, breakfast is okay, good atmosphere, could be a bit cleaner but we highly recommand it. Bon hostel pour passer quelques jours à Plovdid ! Emplacement parfait et personnel très aimable. Dejeuner tres bien. The hostel is very well located and in a very beautiful place. The atmosphere is very peaceful and the people working there are nice. Moreover the view from the 14 people bedroom is beautiful! !About the security... Luckily I tested the locker to see if it was well closed but it wasn't. It could be opened anyway. And they didn't want to give me another one. Furthermore the place was dirty. We even found a mouse in the kitchen. And the bathrooms are not very convenient.